I wrote the first draft of this story in two days, at Clarion in July 2000 (end of week 3, beginning of week 4). 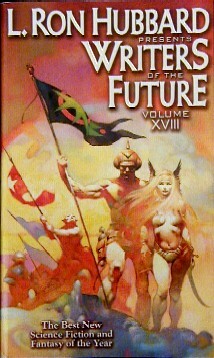 I rewrote it completely, keeping only the central premise and one of the characters, over five days in December 2000. 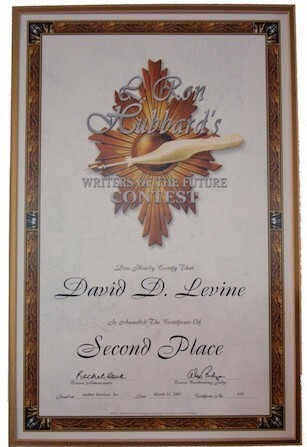 I tweaked it a little bit more before sending it to the Writers of the Future contest in March 2001. I learned it was a winner in July 2001, and I went to Los Angeles for the writers’ workshop and award ceremony in August 2002. Total writing time: seven days. Total time from first draft to publication: two years. This timeline is not atypical. Click here for my diary and photos from the Writers of the Future event. This story started as an experiment in free writing. Usually I plot my stories out completely before I begin writing, but this time I started with one sentence (“Naked, he ran screaming into the night”) and one image (he gets hit by a car and keeps going) and just wrote from there. However, I was unable to overcome my habit of plotting… by the time I had written the second paragraph I knew who he was, how he could do that, and where he was going to end up. Although the initial sentence and image did not survive into the second draft, those basic ideas remain at the core of the story. The first draft of this story was titled “The Memory of Pain,” which is a more appropriate title in a whole bunch of ways. But “Rewind” is snappier, and using it as the title solves a problem some early readers had of not understanding how the central SF premise of the story works. One of the main characters in this story (which was written before 9/11/01 and is set in an alternate universe) is an anti-government terrorist. But from her own perspective, she is a freedom fighter… and by the end of the story, we discover that she is right and the government is wrong. I believe that everyone is the hero of their own story, that nobody thinks of him/herself as a villain. When we keep this in mind, we might begin to understand why people do what they do, and maybe even modify our own behavior to help make the world a better place. A harsh pounding rattled through the room. “Police!” came a voice. “Open up!””Oh Jesus,” said Angel. Her face suddenly looked like dirty white plastic. The cop would be armed. No way he could take him on without a weapon, not as shaky as he felt. “Have you ever been arrested?” He looked in the closet. “Calm. Right.” She took a deep breath, then left. He checked and armed his system as he closed the door of the tiny closet, hearing the cop’s rough voice asking Angel “have you seen this man” and demanding to search the apartment. Thatcher tried to visualize the place from the brief glimpse he’d had earlier, hearing heavy footsteps moving from the front door to the kitchen, to the bathroom… the cop seemed to be making a pretty cursory search of it. This just might work. Booted feet came to the bedroom door. It squeaked open. Creak of the cop’s leather jacket and gunbelt as he looked from side to side. A pause. Two more steps. The closet door jerked open. Thatcher saw his own terrified face in the cop’s black visor as he bit down. Desperate, exhausted, Thatcher slipped under the bed as the cop’s footsteps moved from the kitchen to the bathroom. Sipping air he wanted desperately to gulp, he tried to ignore the smell of the worn and filthy carpet and make as little noise as possible. More footsteps; the door squeaked open. Dusty black boots trod inches from his face, while he held his breath. The closet door opened, then closed. The boots paused, looking around. Drops of sweat slithered down Thatcher’s sides.